Eight carpenters working for the West Mifflin Amusement Park have received early Christmas presents. They will share a million dollar Powerball jackpot (about $750,000 after taxes) after the ticket they jointly held managed to match all five white numbers but not the red powerball. They have requested to remain anonymous and have informed the park management they intend to continue working. 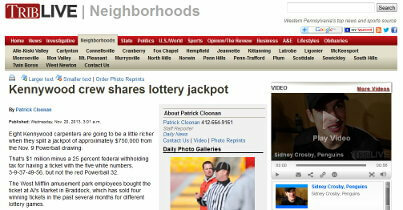 The Powerball syndicate bought the winning ticket from Al’s Market in Braddock, which gets a bonus of $5,000. Incidentally, Al’s Market has sold three other tickets which won significant jackpots: a mid-day Quinto ticket which won $50,000 last May 30, another $1 million powerball jackpot winner in the Sept. 24 draw, and on October 17 sold a Cash 5 ticket which bagged $325,000. This should be a tip for people in the area: Al’s Market has been selling a lot of winning tickets lately, you may gain a bit of an edge by choosing to purchase your tickets there.